Direct Pattern Selection: One touch pattern allows you to simply push a button to select from 10 of the most popular sewing patterns, including applique stitch and blanket stitch. 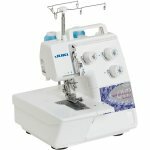 The LCD screen displays the stitch settings, patterns, and recommends the best presser foot to use. Need to adjust the stitch length or width? Just turn the dial and the new settings display on the screen. 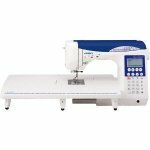 Electronic Buttonholes: Using a unique sensor method, the DX-1500QVP sews 16 beautiful buttonholes for any fabric. Independent Bobbin Winder: Allows you to sew and wind bobbins at the same time. And bobbin winding couldn't be easier! Put the bobbin in place, catch the thread on the base, and push the lever. Quick Threading System: The automatic needle threader, threads the needle with just the push of a lever. Advanced Thread Trimming: The DX-1500QVP allows you to trim top and bobbin threads three ways: With a push of a button, automatically programmed trims and with the foot controlled trimming system. Just rock your heel back on the foot controller, and your thread is quickly and precisely cut. Foot Switch Function: With the ability to assign function to the heel side of the foot controller, you can now trim both needle and bobbin threads automatically. With this feature, you can concentrate on your project while automatically cutting the thread. Auto or Manual Tension Settings: You can use the Automatic Thread Tension or increase or decrease the tension to create different stitch effects. Box Feed: The box feed technology moves your fabric to allow you to create perfect high-quality stitches on all types of fabrics. The box feed system stays in contact with your fabrics longer for a consistent, reliable seam every time. Piece perfectly without worries of shifting or sliding fabrics. Combine, Save, and Recall: Combine decorative stitches or lettering into pattern sequences and save them to the machine memory. The DX-1500QVP allows you to save up to 70 patterns, in 10 memory folders! Recall your favorite patterns with a touch of a button!